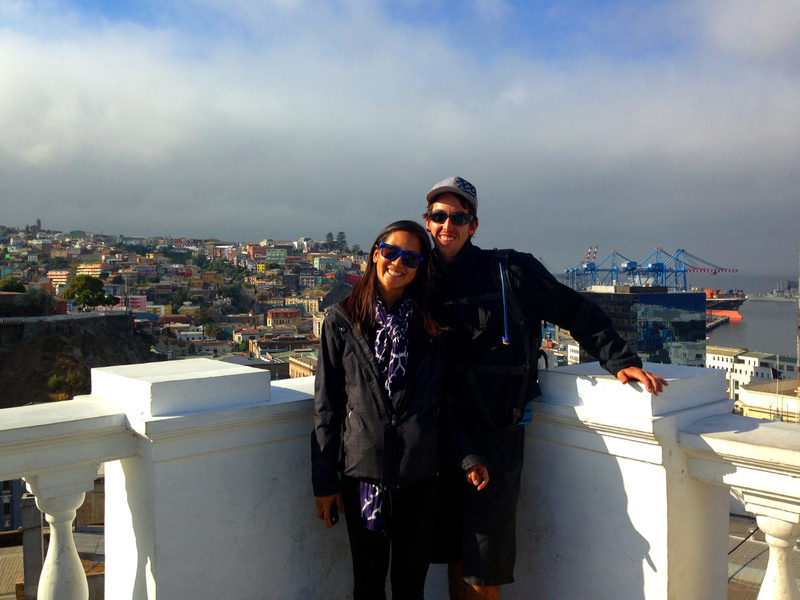 ← Patagonia, Part 3: King Crabs, King Penguins, & The Land of Fire! With only a few words of encouragement, Hannah was an amazing sport and in for the new experience. She would be joining us for our trip from Santiago to Valparaiso and her first CouchSufing experience. One more homemade dinner with Danny and it was off to the ‘Jewel of the Pacific’. 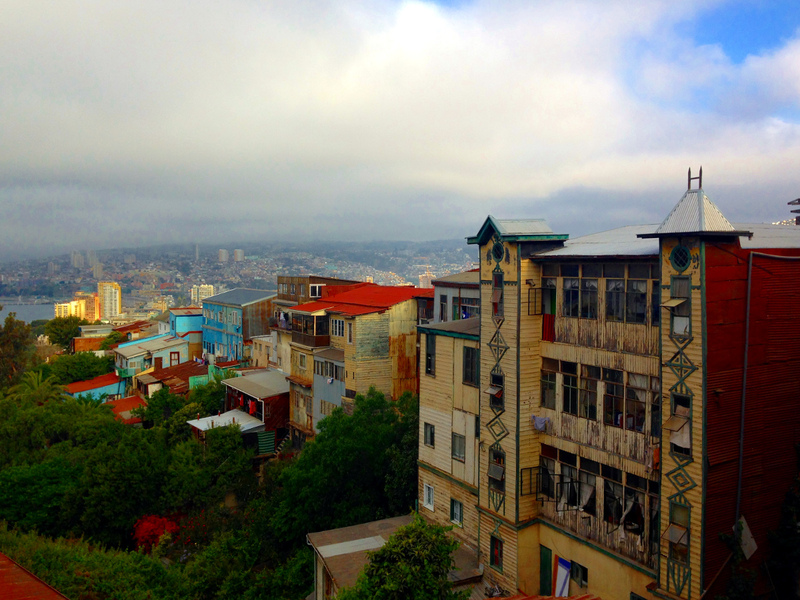 The city of Valparaiso consists of 45 hills, each housing a unique neighborhood. 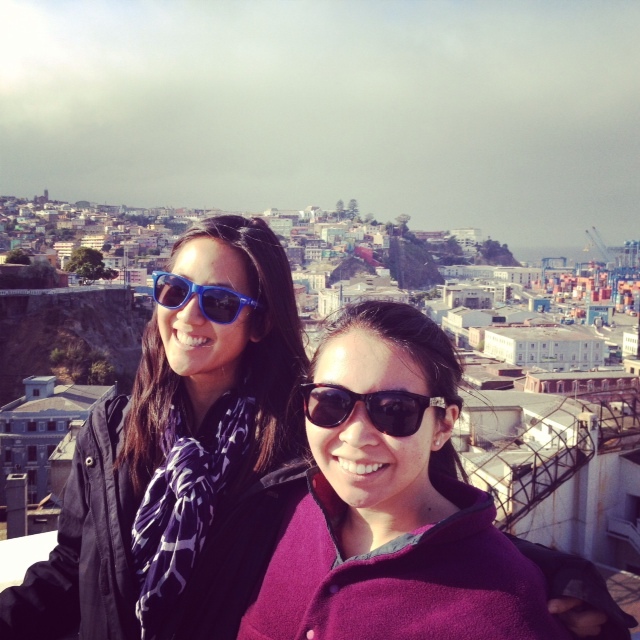 Once in Valparaiso, we took public transportation towards Nacho’s house. By this time, Matt and I had taken many crazy public transportation rides, however this bus ride up the hill to Nacho’s house definitely stands out as one of the craziest. The driver started driving while Matt was still boarding and he was literally hanging halfway out the door for half the drive. Nacho greeted us with a gracious welcome. Hannah commented on how nice he was – she now understood why we like CouchSurfing so much, and are always humbled with people’s generosity. 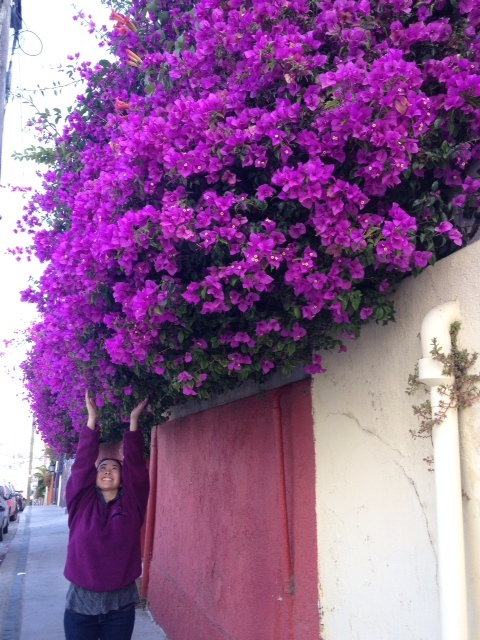 That afternoon we walked towards downtown to see what the ‘Valpo’ buzz was all about and quickly saw why the locals and tourists alike love the quirky city. 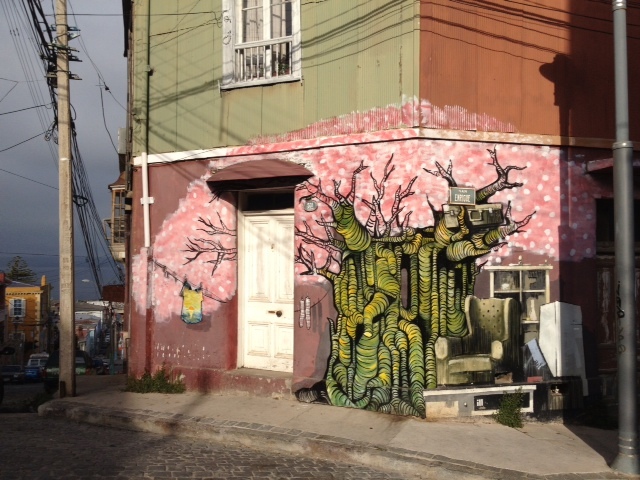 Valparaiso is known for their street art and beautiful graffiti. Nacho was just heading out for the night when we got back to his apartment, and extended an invite to join him and his friends at a local Chilean Folkloric bar. We showed up at the bar early by Chilean standards and were some of the first ones there. People started coming in with instruments – guitars, tambourines, beatboxes. At first glance, we thought, “Great, a live band!” But these were regular patrons of the bar, ready to have an epic, Cueca jam and dance session. Each Cueca song lasts for 2 minutes and has a corresponding dance that follows a particular structure. The beginning of the song is instrumental, and the dancers clap along. Once the singing starts, the partners wave handkerchiefs in the air and dance around each other. Nacho explained that Cueca is a courting dance, mimicking a rooster pursuing a hen (and eventually conquering, signaled by the man’s stomping at the end of the dance). 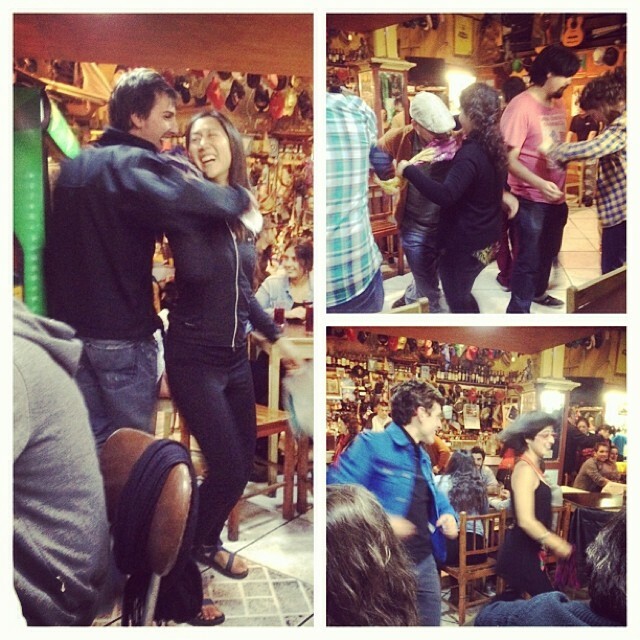 Matt has always been a good sport and tried tango and salsa, but he’s really found his perfect dance with Cueca. Staring at your partner is actually encouraged and the heavy stomping at the end is his forte. Hannah unknowingly wooed an older man (local fisherman) at the table next to us as he repeatedly asked her to dance. When she tried to explain that she had no handkerchief, he happily handed her a paper napkin. 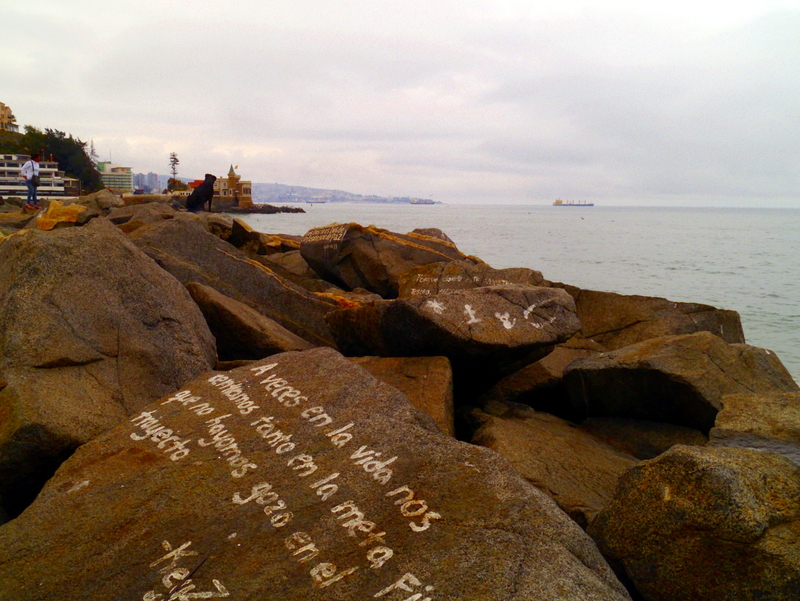 The next day was spent walking down the beach, reading quotes and poems written on the rocks along the seawall. 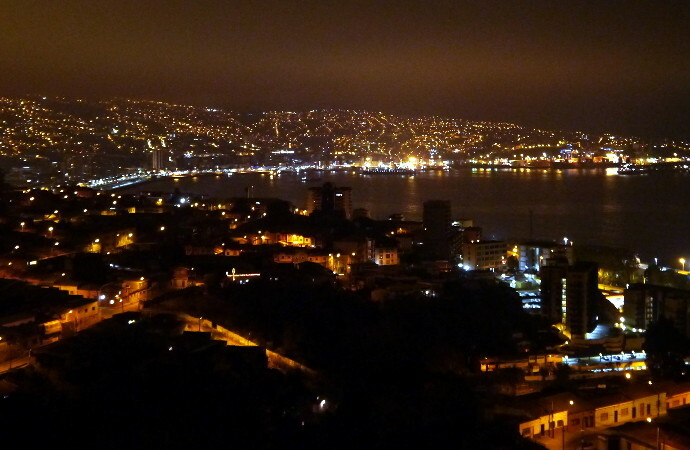 We enjoyed dessert and watched BMX bikers in Viña del Mar, Valparaiso’s more sterile resort beach neighbor. 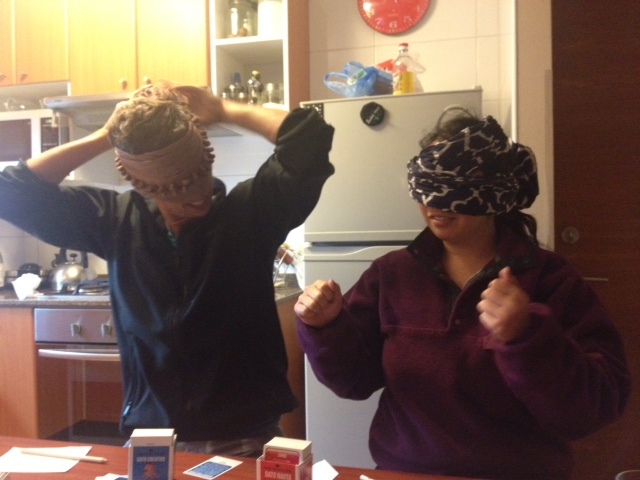 That night, we hung out with Nacho and played Cranium (in Spanish! Double challenge! ), and a really fun French game, Jungle Speed. We had a long day of walking and were exhausted by midnight, but Nacho’s night had not even started yet. 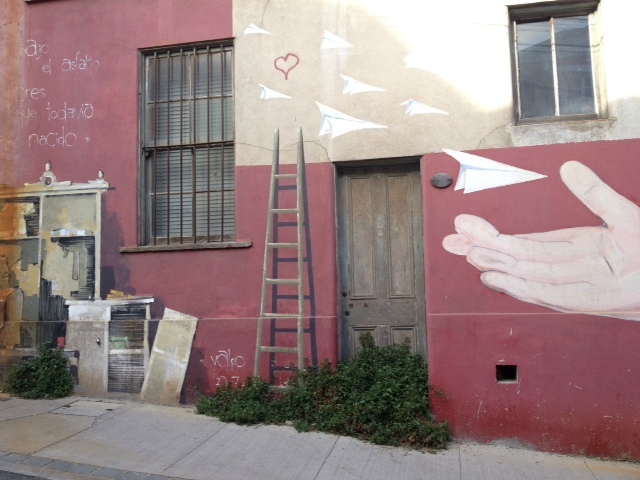 The Chilenos don’t start partying until midnight at the earliest and go until the next morning. Hannah took the bus back to Santiago early the next morning, but not before checking out the local market with fresh fruit and veggies. After saying goodbye, Matt and I took a local bus north to Quintero to check out the beaches. 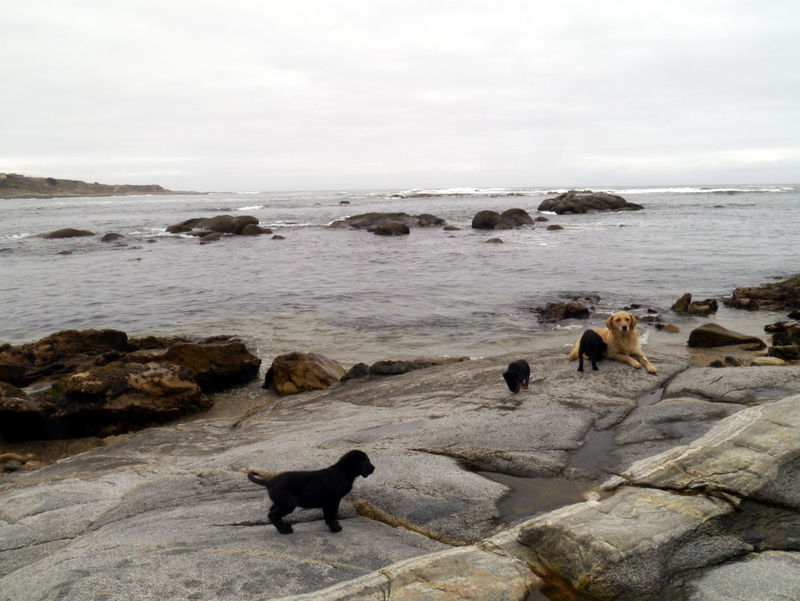 We chose a random corner to get off the bus and luckily ended up at a quiet beach with a few surfers and a cute litter of puppies. 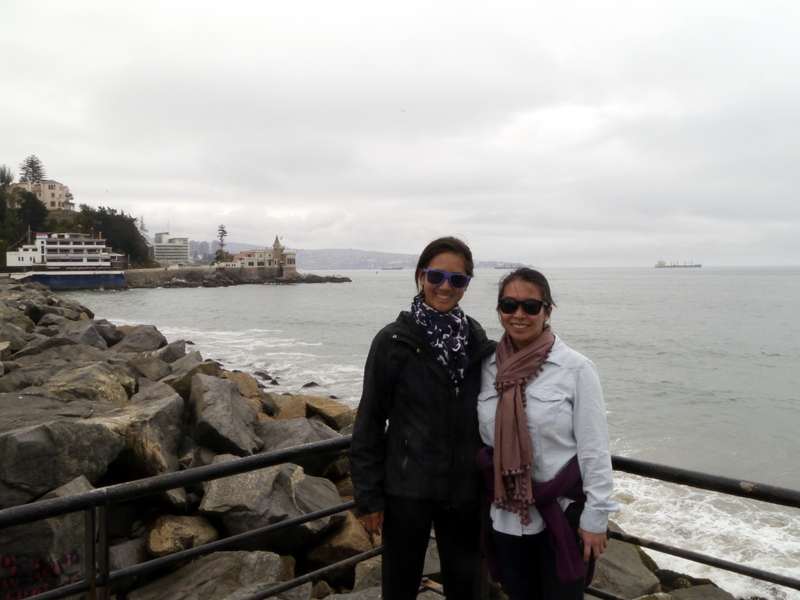 The surprise of this little side trip was finding the best ceviche of our entire trip (sorry, Peru!) at a local ceviche stand. The last beach we’d see in Chile was a Ritoque – a quiet beach with a few surfers and a nice flat area where we were able to play volleyball. The unexpected adventures are often the most memorable. Tur Bus sold us a direct ticket from Valpo to Mendoza, Argentina. 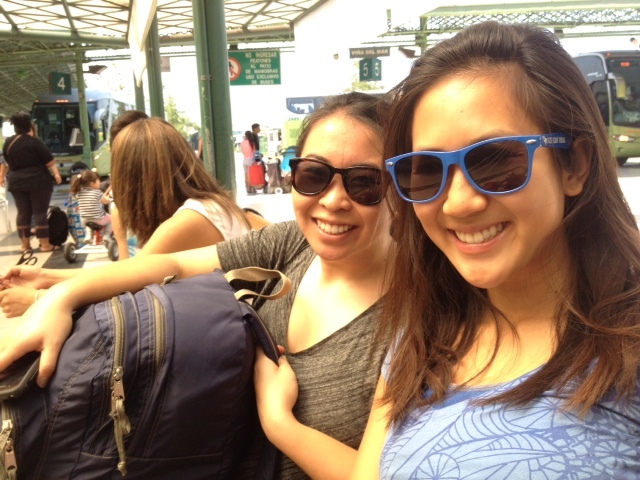 The 8:30AM departure time came and passed without raising any red flags, as buses often run late in South America. But after another 20 minutes passed and there were no other waiting passengers, we got suspicious. Unfortunately for us, the bus we were meant to take departed on time! We were completely unaware because while we were looking for a Tur Bus, the company had actually sold us a seat on a different company! How sneaky! Despite our pleas, we had to buy another non-direct ticket. Minor fiasco passed, we were on our way to the final country on our South American trip.